For the moment the first visible signs of the forthcoming expansion. In the initial phase preparatory work, such as preparations of establishment areas and decontamination in the area. The project is developed into three parts: preparations, dredging and port construction. Preparatory work, now in progress, will be going on until august. Dredging will then take off, and the construction for the port expansion, I e quay and port areas are scheduled to start during summer/autumn 2020. Hans has long experience within transport, logistics and production and was previously with Econova, DHL and Alltransport. We welcome him to Port of Norrköping! Tomas Gustavsson, temp Operations Manager, will be with the company until April 30, and will then retire. Robert Olsson, former Operations Manager, has moved on to new tasks within Port of Norrköping. Magnus Grimhed has extensive experience from the shipping industry. Over the last ten years, he has been active in the Maersk Group on various positions in commercial roles, including General Manager of Seago Line Scandinavia. Since May 2017, Magnus has been working on sales and business development at Port of Norrköping, now taking over as sales manager. - It has been very productive to work in parallel with Tomas and I would like to thank him a lot. He has a long and very solid experience from the port and shipping industry and has meant a lot for the development of the port, says Magnus. - During the past year I have gained good insight into our own and our customers’ activities. At the same time, I have been able to expand my network from previous jobs with many new contacts, says Magnus. I’m really looking forward to further developing the contacts and working close to customers to see how we can create more value. Port of Norrköping is now facing a time of major development. Growth has been good in several business areas, and recently clear signs of the major expansion of the Pampus terminal was given. 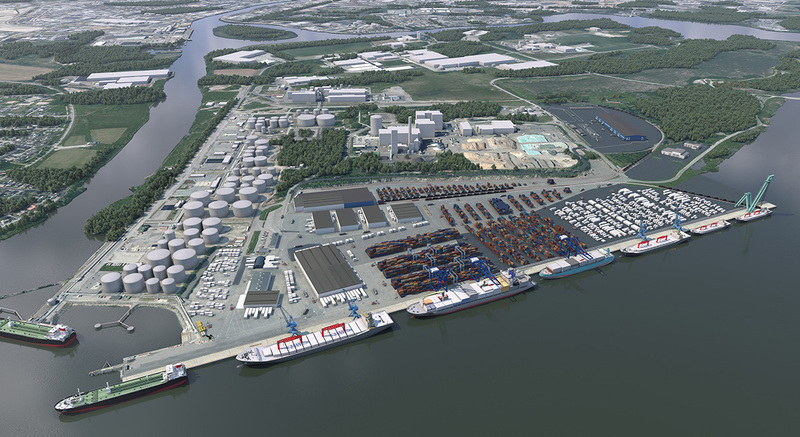 The completion of the expanded Pampus terminal is estimated in 2023 and will mean a significant increase in capacity to meet future demands for increased freight volumes, larger vessels and more efficient production. - We are facing an exciting development. There are certainly real challenges ahead, Magnus concludes. The planned expansion of the port of Norrköping is important for the regions business and the possibilities for efficient and sustainable transport. Now the Environmental court has given its necessary approval for the expansion. The project now enters next phase, with the aim of commencing dredging work in 2019. - We now have the environmental ruling we need to expand the ports capacity. We can now start with the expansion which is needed to cope with increased freight volumes, larger vessels and more efficient production at the port, says Henrik Åkerstöm, CEO, Port of Norrköping. On behalf of the municipality, Port of Norrköping operates the expansion of Pampushamnen at Händelö. It is a part of the transformation of the inner harbor to the residential and inner city area. - I am glad we have got a good start to start such a big and important venture for Norrköping and the region. The port is of great importance for our businesses and the upcoming expansion strengthens Norrköping as one of the country’s leading logistics areas, says Pontus Lindblom, Business director, Municipality of Norrköping. - We ensure efficient supply of goods for our existing and future companies, while at the same time we can carry out an exciting and sustainable urban development in the inner harbor, Pontus Lindblom continues. - It is with great responsibility, but also confidence, we are developing the port. We have an important role to fill to create value for businesses and to build sustainable supply chains in the future, CEO Henrik Åkerström summarizes. Shortsea - what advantages can we get? Last week we broke the news that Port of Norrköping will be shortsea hub for Greencarrier. But what is shortsea and what environmental benefits can we gain? Take a look at our film and see what we think! For a long time shipping has been crucial for long-distance freight transport. Now the interest in utilizing shipping's available capacity and environmental benefits is increasing, even at shorter distances. Now some of the market's leading players make a move on so-called shortsea to Sweden, with Port of Norrköping as a node. 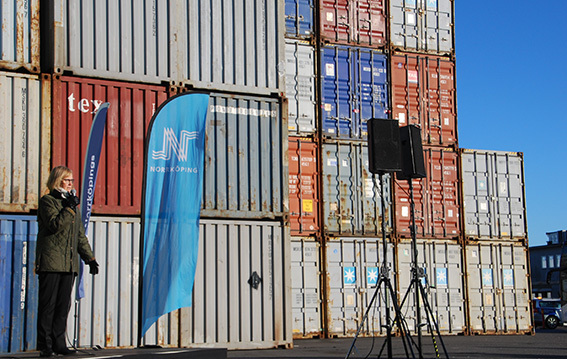 Freight forwarder Greencarrier is behind the new venture, where Norrköping port becomes an important link and distribution point. - We build the concept of feeding vessels that run once a week between Gdansk in Poland and Norrköping. On these vessels we load containers that have been collected at our own terminal in Poland. When arriving in Norrköping we can drive a container directly to the importer or let the piece of goods go to the customer on a truck loop, says Stefan Larsen, Ocean Manager at Greencarrier Freight Services. Behind the shipping line is the container shipping company Seago Line, a subsidiary of Maersk Line. - Seago Line is a shipping company that strongly believes in developing this type of business. Traditionally, traffic to and from the Mediterranean is where we have our large volumes, but in recent years interest and traffic in the immediate area have increased significantly. Not least for our direct line between Gdansk and Norrköping, says Jesper Sundsten, Marketing Manager at Seago Line Scandinavia. - We are, of course, very happy that Greencarrier has chosen Port of Norrköping for this effort, says Magnus Grimed, Business Developer at Port of Norrköping. This confirms our function as a modern and customized port with an incredibly good geographical and demographic position. - With increased awareness about the environmental issue and a lack of drivers throughout Europe, we strongly believe this will be something that many will consider to be a good complement to the traditional trucking solutions from Poland and Eastern Europe, Stefan Larsen finishes. Economic boom and strong development in the region, makes positive financial statements for Port of Norrköping. A summary of 2017 shows record levels, above all for container. But several types of goods show a steady development. 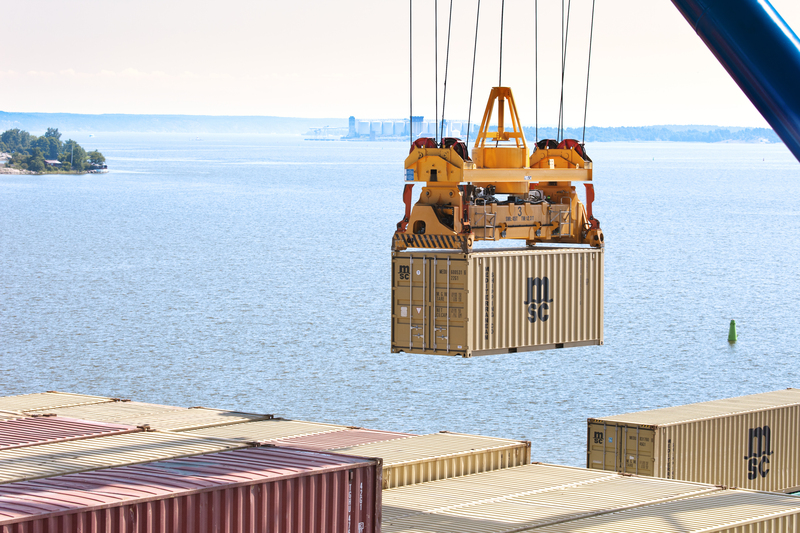 Port of Norrköping has for a long period had a very positive development in the container segment, and 2017 containers increased with 30 % compared to previous year, reaching a record of 132 000 TEU (Twenty-foot Equivalent Unit). The growth is the result of a long-term investment in the container segment, which has favored both import and export business in the region. Several establishments and investments in Norrköping also has created new volumes of goods and has strengthen the ports attractiveness. During the last year traffic services has increased and large container lines are now focusing more on the expanding Baltic Sea region, meaning more container traffic over Norrköping. The total amount of goods in Port of Norrköping has increased over the last years. During 2017 the port handled a total of 4.3 million tons. In addition to container, goods within energy and grain segments are expanding. In mid-November Henrik Åkerström took office as CEO. - Port of Norrköping has a clear market position, steady growth and ambitious development goals. I am excited and glad to be a part of the ports continuing development with increased volumes, and adding new values to our customers. Sustainability is also an important focus for us, where we can see ever more customer requirements, says Henrik Åkerström, CEO. Important and large-scale developments in infrastructure are taking place within and around the port of Norrköping. In November the construction of a new railway connection began. This means an electric and direct railway connection to the port. 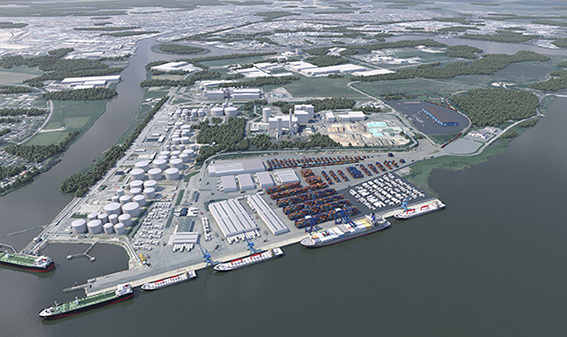 In the meantime, planning of expansion of the Pampus Terminal continues. 640 meters additional quay and 100 000 square meters of new areas are being planned to meet future demands on smart logistics solutions, increased volumes in goods, larger ships and more efficient production. By 2023 the new port is planned to be ready. Norrköping and the surrounding region in Östergötland is still one of the top three logistics locations in Sweden. Now severals actors, Port of Norrköping being one of them, join a new logistics cluster. Every year, magazine Intelligent Logistik, lists Swedens top 25 logistics locations. Norrköping has for several years been among the top three, even so this year. Geographic and demographic location as well as quality and sustainability regarding the regions infrastructure are some of the criteria for making it high on the list. This means locations with a container port, efficient road transportation and good railway infrastructure are strong. - We are glad to continue our consolidation of our position as one of the strongest logistics locations in the country. We have had a strong development in our port, especially regarding container, for the last years. A continuous development of the port is important, both for our customers and for new business established in our region, says Ola Hjärtström, Marketing Manager at Port of Norrköping. Recently, Swedish Agency for Economic and Regional Growth, announced a long-term EU investment on a logistics cluster in our region, Östergötland. Municipality of Norrköping, Region Östergötland, University of Linköping, Port of Norrköping and others will, during a three-year period, build up and establish a joint competence center, based in Norrköping. The cluster will focus on sustainability and long-term structure changes, which makes it unique in Sweden. 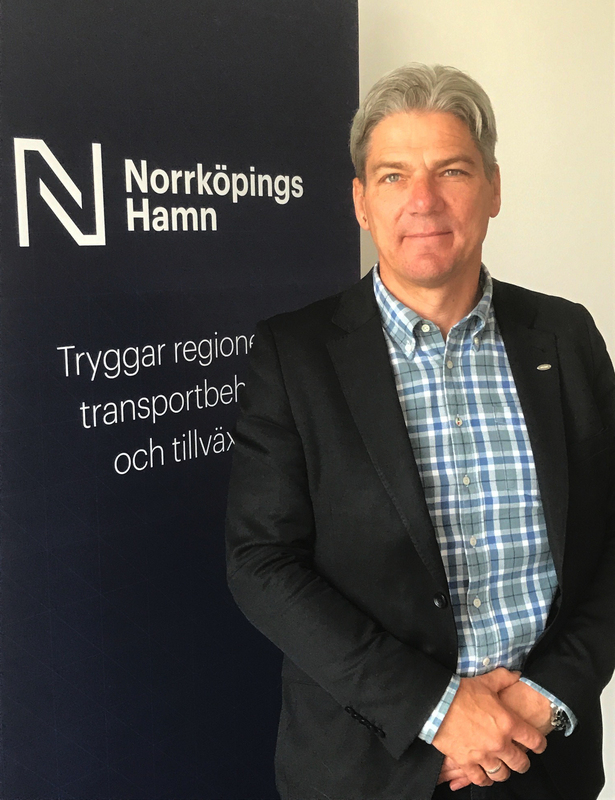 - We will gather competence and operative units for actors in logistics under one roof, to make it easier to act and establish business in the region, says Pontus Lindblom, Business Director at the Municipality of Norrköping. Our geographical location and investments in shipping and railway enables us to offer sustainable transport solutions, which is and will be all the more important. A total turnover of 648 units were handled during a port call on January 18th. Upon completion of cargo operation on the MSC operated vessel “MSC JOY” thursday night Jan 18th, around 22:10 hrs in the Port of Norrkoping, a small internal ceremony marked the occasion of the single largest ever container cargo handled in the port. A total turnover of 648 units were handled during the port call. Since November 20, Henrik Åkerström is our new CEO at the Port of Norrköping. Henrik has long and solid experience in the transport, shipping and logistics industry, with good knowledge of the region's business and development. Previously, Henrik was the CEO of Alltransport in Östergötland AB. Before that he worked at Green Cargo. − I took this job with a clear picture of Norrköping Harbor as a fine company with a clear market position, good growth and ambitious development goals, says Henrik Åkerström. Now, for a couple of weeks, I have gotten acquainted with the company and the employees, and my image has been strengthened. I am impressed with the breadth and competence of the business. At the same time, I see things in our work and the customer values we create that are important for me to work on. Much is about a long-term sustainable approach, which I’m passionate about. It is exciting and a big challenge to contribute to the port’s continued development. Henrik puts a lot of time on getting to know the different parts of the business, being involved in the work at the quays and in the terminals. There will also be a lot of time for contacts with customers and partners. − I know several of our customers and their activities, but I am also looking forward to getting to know new ones. It’s important for me and my employees to understand the customers’ conditions and the values we add. Henrik Åkerström succeeds Patrik Åman, who retired in September. During the fall, the company’s CFO Karl-Johan Ringborg had the role of acting CEO. A new rail bound electrohydraulic knuckle boom crane are now operating at the Öhman terminal. 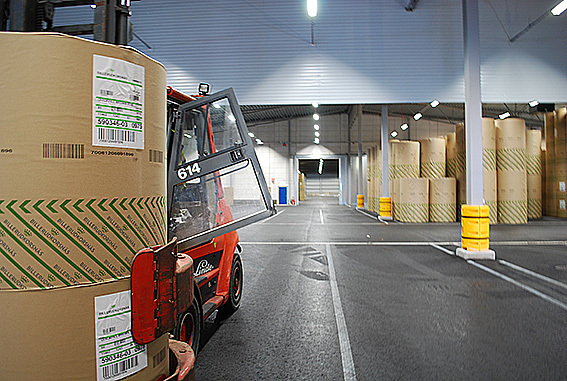 The new crane enables more efficient and flexible handling of goods. Good environmental performance and a good working environment is also a bonus. The crane has a load capacity of up tp 20 tons and a working radius of 26 meters, making it especially suitable for handling bulk goods such as wood chips, timber and pulpwood. The investment is a part of a larger modernization of the port’s cranes, where we over time have invested in three new rail bound cranes of different sizes. – We are in a strong growth phase with new customer assignments, says Ola Hjärtström, Marketing Manager at Port of Norrköping. Our latest crane is a welcome investment, increasing capacity and a part of our long term development strategy. New crane no 45, working side by side with crane 47. We want to inform about upcoming price changes in our current port tariff. Unless otherwise agreed, prices will increase with an average of 2 % from January 1, 2018. Our adjustment of the prices are due to increasing costs regarding, amongst others, staff, leasehold, electricity and fuel costs. We are looking forward to a continuing cooperation for the next year! 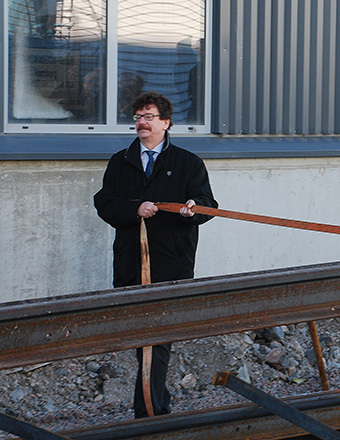 During Monday November 13, the start of the new rail link – Kardonbanan – was initiated. The so called Kardonbanan, is a new electrified railway between the Southern main line near Åby and the port of Norrköping. 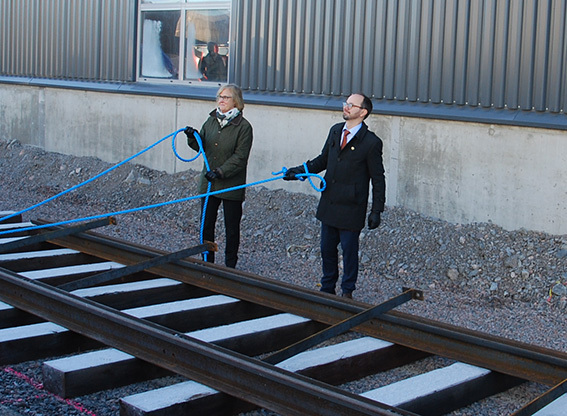 To initiate the construction start, Minister of Infrastrucure, Tomas Eneroth, Director-General of the Swedish Transport Administration, Lena Erixon and Lars Stjernqvist, Chairman of the Municipal Council from the Municipality of Norrköping, all took part in a symbolic construction start in the Pampus Terminal at the Port of Norrköping. – The purpose of building this railway is to strengthen the capacity of goods and in a clever way take advantage of previous investments. Kardonbanan is historically important, borth for the city of Norrköping, but also for Sweden. This investment creates opportunities for businesses to set up and invest in the city, said Tomas Eneroth, Minister of Infrastrucure. – Finally, after 25-30 years of negotiation and discussions are turned into action, says Lars Stjernqvist, Chairman of the Municipal Council from the Municipality of Norrköping. An effective handling of goods, and to increase the amount of goods transported by rail, is important to the Port of Norrköping. – This is very awaited. We have worked with this project for many years, so today is a big day, says Ola Hjärtström, Marketing Manager at the Port of Norrköping. Minister of Infrastrucure, Tomas Eneroth and Director-General of the Swedish Transport Administration, Lena Erixon. Lars Stjernqvist, Chairman of the Municipal Council from the Municipality of Norrköping. Port of Norrköping has a steady growth in operations. Now that most of the year has passed, we can note that last year's strong volume development continued even in 2017. Several business segments has developed well over the year - especially the container segment. - During the last two years, container volumes in Port of Norrköping has more than doubled, says Ola Hjärtström, Marketing Manager. The growth shows clearly that our strategy is working and that we add value to our customers. However, it has been a challenge at the same time, when the growth has been faster than planned, due to the strained situation in other ports in Sweden. The sharp increase is mainly due to a strong and growing catchment area, new customer assignments and a stable range of shipping lines. The leading container lines are currently represented in the port on weekly basis. At the same time, rail traffic to the combined terminal in the port has also increased. - We continue to work to achieve increased accessibility and a stable service level for our customers, says Robert Olsson, Production Manager. It is partly about increasing our workforce, but also about increasing efficiency in existing businesses and finding new ways of operating. Henrik Åkerström, 51, is new CEO of Port of Norrköping. He follows current CEO, Patrik Åman, who retires. - We are pleased to have found a new CEO who will continue the work to further develop the company. Port of Norrköping is a successful company with exciting challenges in the future - both commercially and with a planned expansion of the port. We are convinced that Henrik Åkerström will continue to take the company forward, says Hans Lundin, chairman of the board of Port of Norrköping. 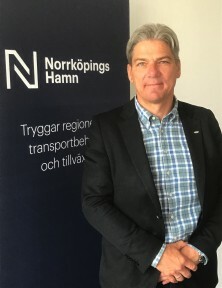 Henrik Åkerström comes from the CEO post of Alltransport I Östergötland AB. He has long and solid experience in the transport, shipping and logistics industry, and has a great knowledge of the region’s business and development. - I think port of Norrköping is a solid company with good growth and a clear market position with ambitious development goals. It is a big challenge and extremely exciting to lead the business further and I am convinced that I can contribute to the development of the port, says Henrik Åkerström. Henrik Åkerström will take over as CEO during the fall. 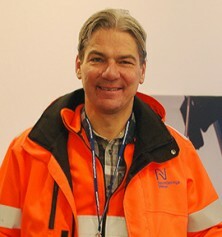 On May 15th, Magnus Grimhed starts to work at Port of Norrköping. He will eventually succeed our current sales manager, who will retire in the future. During the last ten years, Magnus has been active in the Maersk Group at various positions in the sales field, of which the last three years as General Manager of Seago Line Scandinavia. We are pleased to be able to connect Magnus’s broad knowledge and industry experience to us, and warmly welcome him to the company! We are experiencing positive times regarding both foreign trade and traffic. This is shown through a stable development in several types of goods, handled by the port. During 2016 goods volumes handled in the Port of Norrköping increased by 7 % compared to 2015. This is good increase of growth in comparison with the country’s total port volumes, where the increase was relatively marginal. In particular, the success of container handling is evident, where Port of Norrköping increased by 60% in 2016, and with an unprecedented growth rate during this year’s first months. - The growth is the result of a long-term container initiative that benefits both import and export companies in our region, says Port of Norrköping CEO, Patrik Åman. We have also had several establishments and investments in Norrköping that creates new volumes of goods. This strengthens the port’s attractiveness, and in recent years traffic has increased, he continues. The significant increase in containers in a short period of time, has of course also meant that parts of the port operations have been affected. At the beginning of the year, the company has therefore strengthened its capacity with staff recruitment and investment in an expanded machine park, to be able to handle continuing volume increase. The major container shipping companies are investing in increased traffic in the growing Baltic Sea region. Norrköping is well situated, with its strong port and logistics location, with capacity to handle large ships, and several of the leading container shipping companies now operate the port. - We have a good balance between import and export. It favors container shipping companies that can be well-stocked in both directions. When shipping companies invest here, our hinterland area grows, while providing an efficient container port with high capacity and flexibility, Patrik Åman finishes. 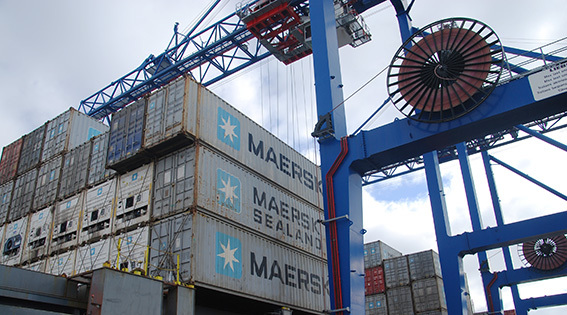 Seago Line, Maersk’s european short sea shipping company, has launched a new container line connecting Sweden and Poland. Norrköping is one of the stops. “We are happy to offer our customers in both key Baltic markets a solution that meets their specific transportation needs and enables further trade growth”, shares Wojciech Muchlado, Seago Line Managing Director for East Central Europe. Officially launched on 28th January 2017, the new service connects Gdansk in Poland with Gävle and Norrköping in Sweden and continues further to Bremerhaven in Germany and Felixstowe in the UK. Vessels from Gdansk towards Sweden depart on Saturdays and offer a competitive transit time of two days to Gävle (arrivals on Mondays) and four days to Norrköping (arrivals on Wednesdays). The new service also offers an additional connection from Sweden to the hub in Bremerhaven by making use of Gävle and Norrköping ports as an alternative to the more congested Swedish west coast. During the past year the container volumes have increased substantially in the Pampus Terminal. This means we can not keep the same short lead times at drop-off and pick-up of containers as before. During the past year the container volumes have increased substantially in the Pampus Terminal. Behind the rise are several new flows of goods and customer orders, both on import and export. 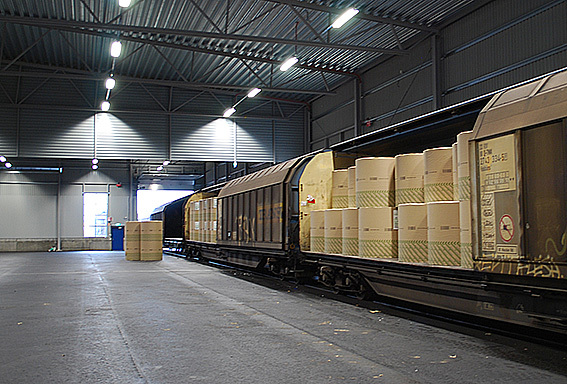 Shipping and rail operators have expanded their services, and as an effect car traffic for incoming and outgoing deliveries of the units have consequently grown. This volume growth means that today we can not keep the same short lead times at drop-off and pick-up of containers, as we made earlier. Especially during certain times, such as near the breakfast and lunch breaks, the customer can expect a little longer wait in the terminal. We are pleased to see a continued increase in the container segment, and works long-term to continue the development of productivity, the organization and the entire port facility. A new electrified railway, between the Southern main line near Åby and the port of Norrköping, the so called Kardonbanan, is being planned. This means shorter and greener transport of goods by rail to and from the Pampus terminal. Construction starts this year. The construction of this railway, also lays the foundation for the high-speed railway Ostlänken, and makes the handling of goods more effective and increases the amount of goods being transported by rail. The project is run by the Swedish Transport Administration and the Municipality of Norrköping. For the port of Norrköping, the new railway to the Pampus terminal is long awaited. The port is important for the regions business, and an intermodal node where sea, road and rail converge in a combined cargo terminal. 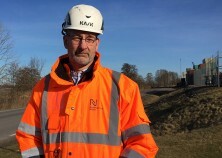 The railway project is one among many infrastructure projects where the fairway has been expanded with capacity for the increasingly larger vessels operating in the Baltic Sea, and where there also are plans for a new road connection between the port and the major European and national roads passing Norrköping. 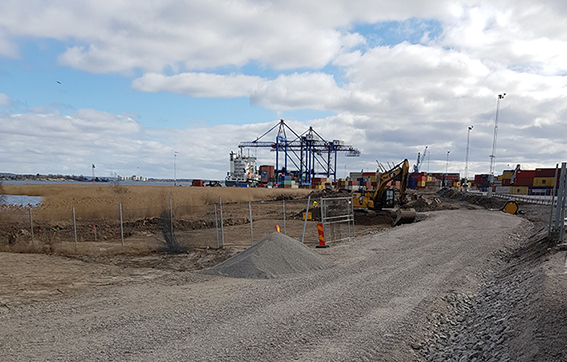 Port of Norrköping and the Municipality of Norrköping are working on the project of expanding the Pampus terminal, as the inner harbour in the central part of Norrköping is being transformed into residential areas. The expansion is expected to be completed by 2023, with doubling of the quay length and increased handling surfaces. For the port of Norrköping, the new railway means a number of improvements and development opportunities. Freight volumes are predicted to increase, and the electrified rail connection means a shorter distance to the terminal and an opportunity to avoid traffic with environmentally harmful diesel locomotives. It also makes it easier to combine rail and shipping for long-distance freight transport, which is a key objective for national goods transports. - For the port, this means shorter and greener transport of goods by rail to and from the Pampus terminal. That means the port of Norrköping may offer a more efficient handling of goods which provides a better solution for our customers, says Ola Hjärtström, marketing manager at the Port of Norrköping. Now our new expanded weather-protected warehouses, is in use. Here we store and stuff in containers export freight for paper manufacturer BillerudKorsnäs, among others. The warehouse has been expanded to double size, about 12 000 square meters, has indoor train tracks and eight work places for container stuffing. Adjacent, a further railway track is now being built. We are experiencing an increase regarding container stuffing of paper products, and we are expecting further extensions of planned volumes from several suppliers. The volumes are mostly received by train, stored, and then exported with shipping (container) but also by road transport. 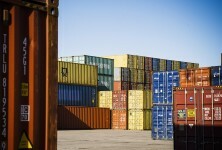 Read more about our Storage and Terminal services and Container stuffing. In september, Unifeeder started to traffic Port of Norrköping. Unifeeder, a commercial feeder company, starts to traffic Norrköping. This is a consequence of CMA-CGM’s change of strategy, where they are now focusing their traffic on direct lines between the continents. With this change, the stable development we have in the container segment for the moment, continues. 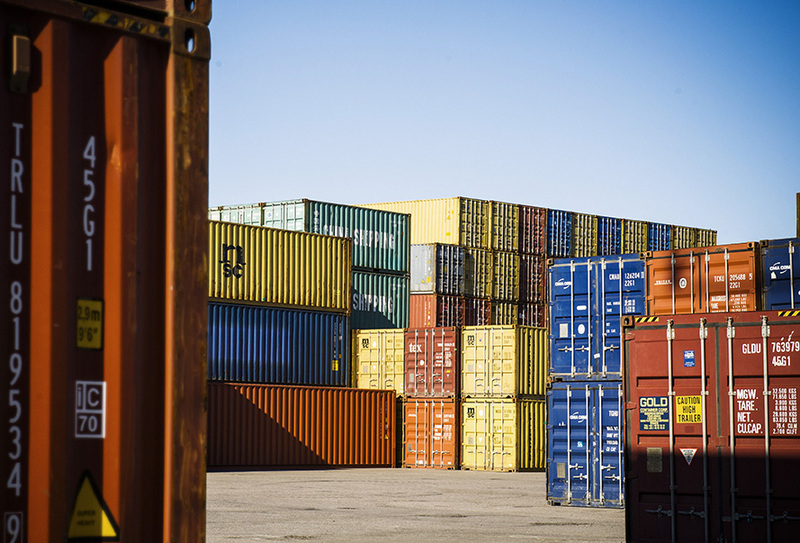 Regarding handled containers in the Port of Norrköping, we have increased the numbers by 57% during January-August compared to the same period in 2015. 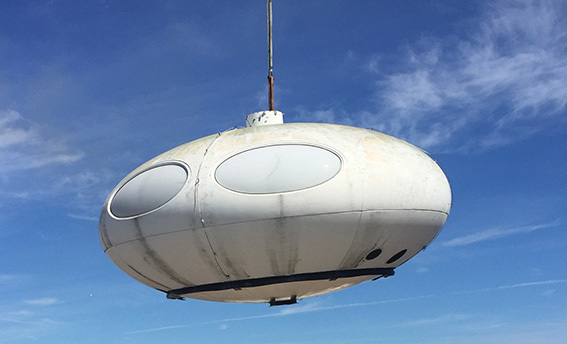 A special load of two so-called Futuro houses, arrived to the port of Norrköping on June 22. The Futuro houses were produced during 1968-1974, designed by Finnish architecture Matti Suronen. The houses, which are ca eight meters in diameter and four meters high, are built of fiberglass plastic, originally designed as holiday homes. In Sweden, the Swedish Armed Forces, has owned these two Futuro houses, since early 1970’s. They have been used at a practice shooting range south of Söderhamn, where they were placed on top of concrete towers, 14 meters high. During spring the houses were dismantled and have now been transported by sea to the port of Norrköping. One of the houses will be used for conferences by The Swedish Air Force Museum in Linköping. The other house will be sold on the open market after restoration. In total, 100 of these houses were built during the production years. There are about 60 houses remaining worldwide, and the houses, that have become cult, are internationally sought after by enthusiasts. Follow vessels in Port of Norrköping via map and AIS on our website. 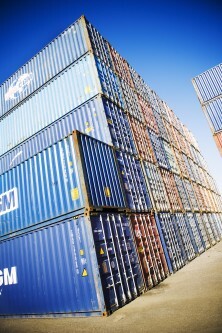 From July 1, new rules on the weighing of sea containers applies. Filled sea containers must now have a certified gross weight before being loaded for shipping. The rules are based on regulations from IMO, International Maritime Organisation, and means that filled sea containers must have a certified gross weight before being loaded for shipping. The gross weight is determined by weighing, and the information must appear on the shipping document. A special certificate, VGM (Verified Gross Mass), shall verify the export container’s total weight. The regulations state that it is the transport buyer / sender (“Shipper”) who shall ensure that the verified gross weight of the container appears in the shipping document. If the shipping document for a full container lacks information on verified gross weight, it will not be loaded on the ship according to the regulations. More information about routines and pricing is available here. From Monday April 25 our two goods offices in the Pampus Terminal are being merged into one office at Oceangatan 9. With this change our commitment is to provide a comprehensive, efficient and flexible customer service for the whole terminal. Along with this we also change the traffic flow for all incoming traffic to the Pampus Terminal. Attached map (PDF) shows hos traffic will be managed. Loading/unloading after 18.00 requires notification of shipping documents no later than 17.00. This applies to all goods except containers. Pre-notified goods are cited straight to gate as before. Last Friday the new crane at the Öhman terminal was used for the very first time. 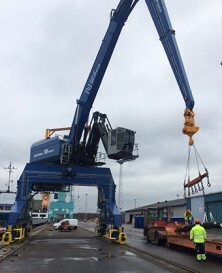 This crane is the first of two cranes that Port of Norrköping invest in this year. Next crane will be delivered to the Pampus Terminal this summer. The crane is an electrohydraulic, knuckle boom crane on rail. The crane has a load capacity of 6-21 tons and manages vessels with a width of 20 meters. The crane at the Öhman Terminal will be used for different types of bulk goods and will complement our other mobile and rail cranes. From being Norrköping Port and Stevedoring for many years, we now become Port of Norrköping, in short. At the same time we renew our graphic profile, which for example can be seen here at our new webpage. It is in a time of change and many exciting challenges that we are sharpening the company’s profile. During the following years we will leave the Inner harbor, and we are in the midst of planning a conversion and expansion of the Öhman and Pampus Terminals. It is a large and important project, which in the long term will secure the regions need of proper transport, and strengthens regional economic comptetitiveness. At the same time we make room for other valuable development in the city of Norrköping. With the development we are facing, we want to make clear our position and simplify the communication with our surroundings. Our new brand will strengthen the image of our business as modern, long-term and industrial. Our new logotype is easily associated with logistics, and builds on the idea of directions, movements and nodes, but also cranes and berths. That brings to mind our business within port, transports and logistics. Welcome to Port of Norrköping! 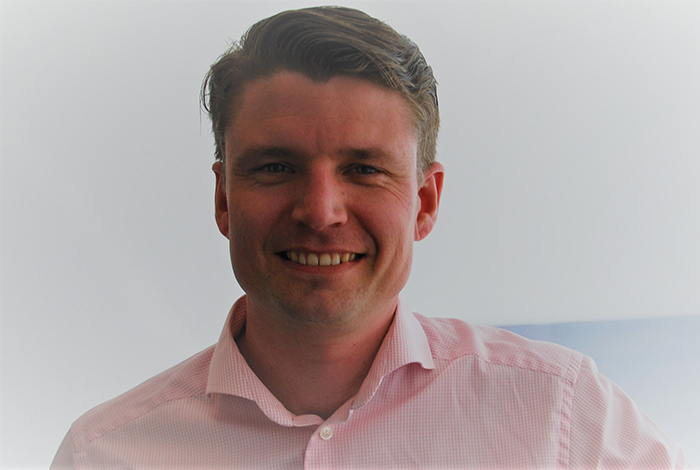 Since August, Port of Norrköping, has strengthened the organization with Robert Olsson, our new Production Manager. Robert Olsson takes up the post as Production Manager after Tomas Gustavsson, who now will focus more on sales, as Sales Manager. Robert is educated Sea Captain, and has also studied business and organization. Before joining Port of Norrköping, Robert was employed at SMHI, the Swedish Meteorological and Hydrological Institute, as Group Manager of Ocean and Sea Ice Forecasts. Earlier in his career he worked for GAC (Gulf Agency Company) in Dubai, USA and Brazil, and he has also served with Wallenius Shipping, Silja Line and Star Cruises, Malaysia. Port of Norrköping raises the question about benefits of short sea shipping as a more sustainable transport solution, in a new animation. We want to raise the question of a more sustainable transport solution and a way to transport freight in a rational manner. With short sea shipping, we can reduce the flow of freight trucks and travel the same route in more efficient ways - which will lead to great environmental benefits. Watch our animation and think in new ways! Investments in the port of Norrköping strengthens the entire East Coast’s region as a logistics location. That is concluded in the magazine Intelligent Logistics in its annual survey of logistics locations. Norrköping region, together with Gothenburg has for several years topped the annual ranking of logistics positions. A number of elaborate criteria including demographics, infrastructure, logistics area, service and partnerships are rulers of the survey of localities and regions’ competitiveness in the logistics field. The region around Norrköping is considered to have an optimal demographic location close to the main markets. Particularly singled on rail and highway connections with excellent standard. During the past year, several companies located their logistics operations to the region, including Rusta setting up a new central warehouse of 63 000 m2 adjacent to the Port of Norrköping. - It’s great that we consolidate our position as a logistics location. 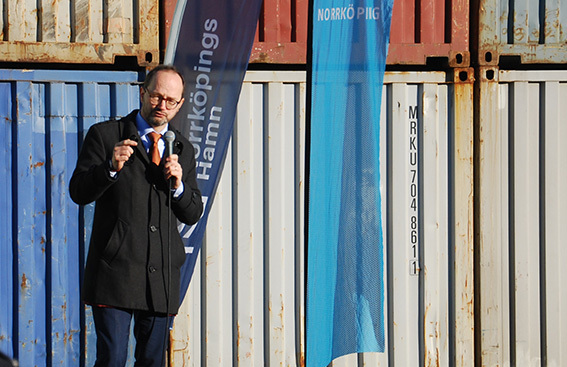 The development of the harbor is important for our customers and for new businesses that have chosen to establish themselves here, says Ola HJärtström, Marketing Manager at Port of Norrköping. Five years ago we opened a new container terminal at the Port of Norrköping, while also shipping channel to the port was expanded. - We are now seeing the effects of the investments made. On the container side, we receive larger ships. During the last year the number of sea containers increased by almost 10%, and we are experiencing continued strong growth during the year. Norrköping Port and Stevedoring will attend the international Transport Logistics exhibition in Munich on May 5-6. If you want to meet with us, please contact Marketing Manager Ola Hjärström at ola.hjartstrom@nhs.se or +46 11 25 06 55. The Swedish Maritime Administration has stated a new max. draft in Lindö Canal and in the fairway to quay 38-40. The new draft in Lindö Canal is 7.30 meters. The new draft to quay 38-40 is 6.80 meters. We will provide further information and details as soon as they are known. We wish all our customers, partners and others a merry Christmas and a happy new year. As a tradition, we support the Swedish Sea Rescue Society with a Christmas gift. South China Morning Post recently published a Sweden Country Report, with an article about Port of Norrkoping as a Nordic and Baltic hub. South China Morning Post specifically identifies the importance of the port for containers and project cargo, but also tells of the planned investment in a new cross-docking terminal in the port area. NHS is now authorized by the Customs Department to receive electronic clearance certificate for export. Clearance certificate replaces the export accompanying document, and the information sent electronically goes directly to NHS. The authorization relates to the electronic messages ZKB and ZKL from Customs. Load Location Code is VR 9. Any questions answered by Lennart Sedhav, phone +46 11 25 06 81. During September, Linn Almcrantz taken up the position as Environmental Officer. Linn will work with operational and strategic environment and the company’s environmental management system. She comes from a position as an environmental engineer at ONE Nordic AB (formerly E.ON ES Sweden AB). Linn is warmly welcome to our company. To strengthen its services in Scandinavia and the Baltic region, container shipping company CMA CGM is now starting a weekly service between the Port of Norrköping and Zeebrugge in Belgium. French CMA CGM is the world’s third largest container shipping company, with 400 ships and more than 150 routes in a global transport network. The Company believes in a strong performance in the Baltic Sea region, and has invested in several new own vessels between the east coast and ports on the continent. CMA CGM sees increase in export and import volumes in Norrköping region, and the new line’s schedule and destinations is an additional contribution to the port’s existing container traffic. CMA CGM calling on Tuesdays / Wednesdays in a loop from Zeebrugge via Kaliningrad to Norrköping and then on to Rauma, Gävle, Hamburg and back to Zeebrugge. The new container traffic began Tuesday, June 11. Norrköping container port is now served by shipping lines CMA CGM, MSC, Team Lines and Transatlantic. We develop not only the port. We have also taken the opportunity to renew our website. Ambitionen har varit att skapa en levande och lättillgänglig webbplats med tydlig information om hamnens roll och utbud av tjänster och trafik. The ambition has been to create a vibrant and accessible website with clear information about the port’s role and the range of services and traffic. - New map of the port with detailed information about our terminals. - Under For Arrivals we have collected useful facts about activities in and around the port. - E-services to customers with access to our online services login in the upper right corner. - For media and other interested parties there is a pressroom, including an image bank. We hope you will like the website. If you have comments and / or questions, feel free to Ola Hjärtström, Marketing on telephone +46 11 25 06 55. The region around Norrköping is one of the strongest logistics locations in Sweden, where port of Norrköping has a great importance. That is concluded in the magazine Intelligent Logistics in its annual survey of logistics locations. A number of elaborate criteria about including demographics, infrastructure, logistics area, service and partnerships are rulers of the survey of localities and regions’ competitiveness in the logistics field. It´s noted that the expanded container port and intermodal terminal in the Port of Norrköping is a very important resource for the region. Finally, the paper also points to the importance of good access to land and establishment leading logistics education and research at Linköping University. Norrköping region, together with the Gothenburg has for several years topped the annual ranking of logistics positions.